This picture was submitted by Nancy Mason Howerton. She was in 2nd grade for this picture. Miss Gretchen Stennet was the teacher for the 1st through 4th grade that were all in one classroom. Mr. Demuth was principal, but he's not in this picture. Back Row: Miss Stennet, teacher, Cook Mrs. Wachter, Janitor Mr. Wachter. 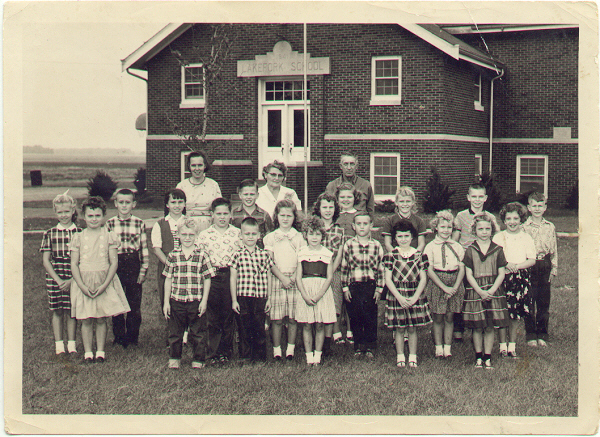 The children are Kay and Linda Allspach, Gloria, Lloyd Lee and Ada Moore, Patsy Berry, Danny Phillips, Judy Cardoni, Martha, Brenda, Linda & David Bachmann, Mark Awe, David Leesher, Patty Creager, Shirley Follis, Gary & Michael Bryson, Lynn Barr, Nancy Mason.